National Archives of Canada (C-020890). Troops Enter Fort Garry during the Red River Resistance, North-West Territories, 1870. The goals of the "Canadian Military History" section of our website are explained. 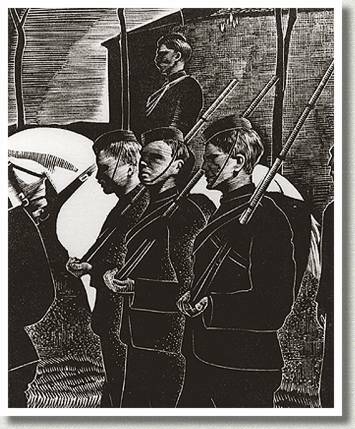 "Beginnings" recalls the military in Canada in the 1800s, from British troops supported by all men in the colony, who were required to muster for training once a year, to a small Canadian permanent force army supported by militia volunteers. Canada’s contribution to the Boer War - The Canadian army's first major overseas campaign, British imperialism and Canadian defence policy, and the 1904 Militia Act are discussed. Highlights include the causes of the war, Canada’s state of readiness, the homefront in the early years, trench warfare and the major battles, the United States entering the war, a change of tactics, and the last 100 days. Highlights include the treatment of Canada's veterans of the Great War, the political and economic changes of the 1920s and 30s, and Canada’s preparedness for the Second World War. Highlights include Canada’s preparedness for another war, the homefront during the war, training in Britain, and fighting in Sicily, Italy, Normandy, and the Netherlands. Read about Canada’s, and the Canadian Military’s, place in the ever changing world order since 1945 including the Cold War, the Korean War, Peacekeeping, the Gulf War, and Afghanistan.